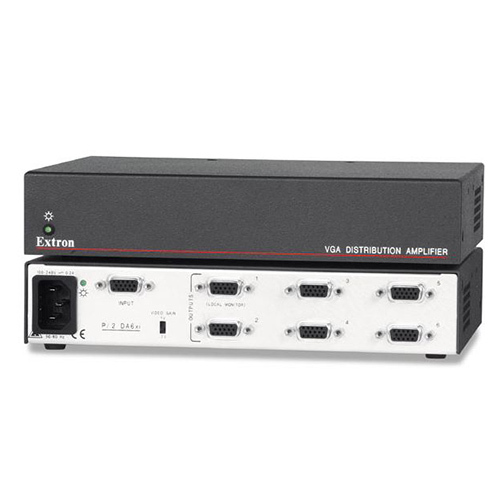 The Extron MPS 112 Media Presentation Switcher can switch between multiple VGA, S-video, and composite video signals, enabling presenters to incorporate and access a variety of different sources. Direct switching of multiple video formats to attached displays provides an ideal solution for many conference room and classroom environments. Together with a wide range of audio features, the MPS 112 can accommodate virtually any presentation environment. 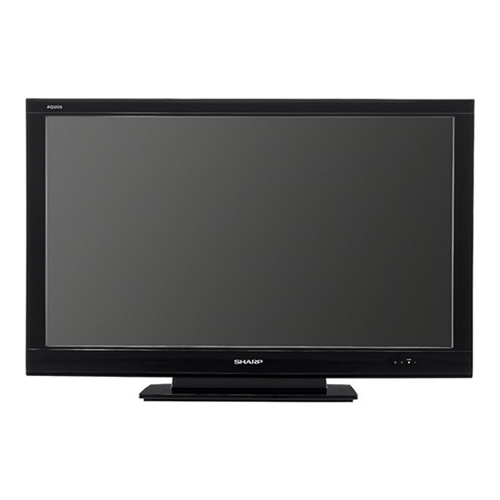 Categories: Misc, AV Presentation Rentals, Video Rentals, Video Signal Processors. The MPS 112 includes an unbalanced microphone input on a 1/4-inch connector, a 15V microphone power switch for dynamic or condenser microphones, and an unbalanced program audio output on RCA connectors. The switcher can be mounted in a rack or podium, as well as under a desk, for easy and trouble-free integration. It can be controlled via the front panel buttons or RS-232. This is a flexible and intuitive to use media presentation switcher, designed to streamline operations, and centralize video and audio switching. 350 MHz (-3 dB) RGB video bandwidth — Maintains signal integrity. Program audio breakaway separates audio signals from video signals — Adjustable via the front panel or RS-232 serial control. Single Switcher mode — Allows one-touch switching. 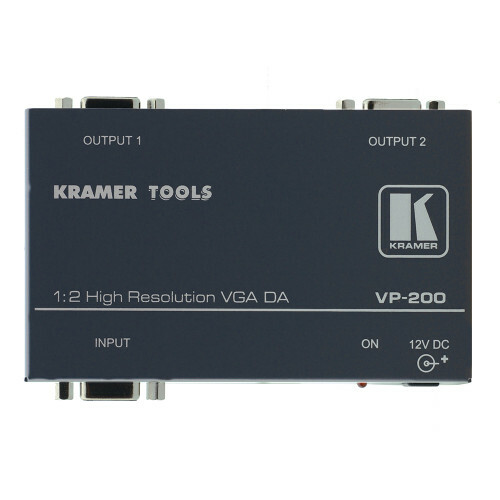 When one of the 12 inputs is accessed, the signals of the input will be routed to the outputs of its group, as well as to the Program Audio output. Outputs of the other groups are muted, while audio output is centralized to its own group. 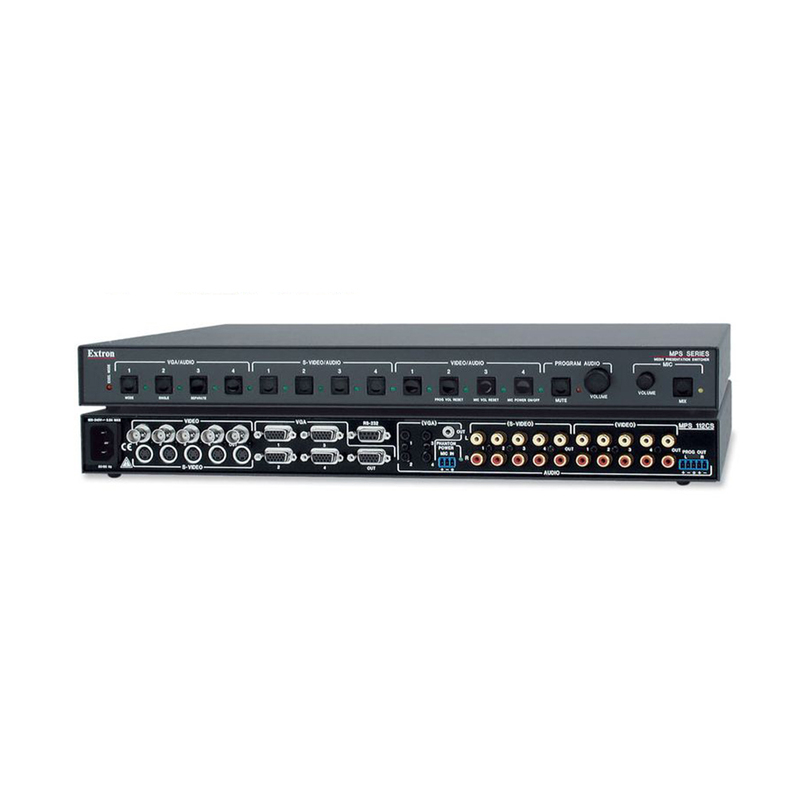 Separate Switcher mode — Allows independent switching to the audio output of any given I/O group. This effectively breaks the MPS 112 down to three separate switchers in one box. The Program Audio is able to output the audio signals from any group, while cueing up for another group without interruption. Microphone input on 1/4-inch phone jack — Complete with volume and mix control, the MPS 112 enables voice announcements with an unbalanced mono microphone input.